Caterpillar Local Host Plant: Falcateria moluccana (Fabaceae, common name: Albizia). 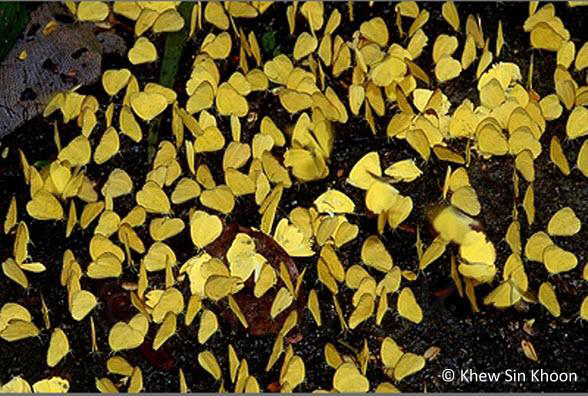 A large group of puddling Three Spot Grass Yellow adults. 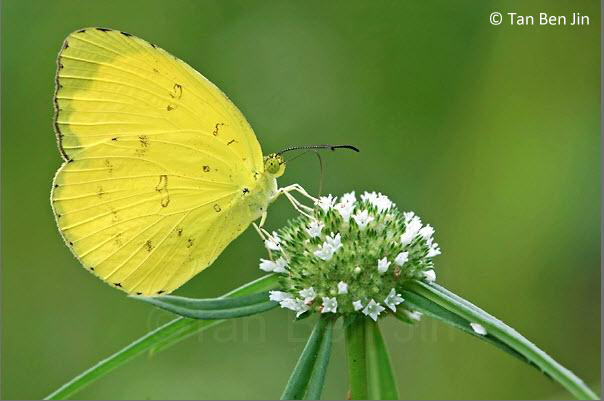 A Three Spot Grass Yellow with the "three spots" illustrated. 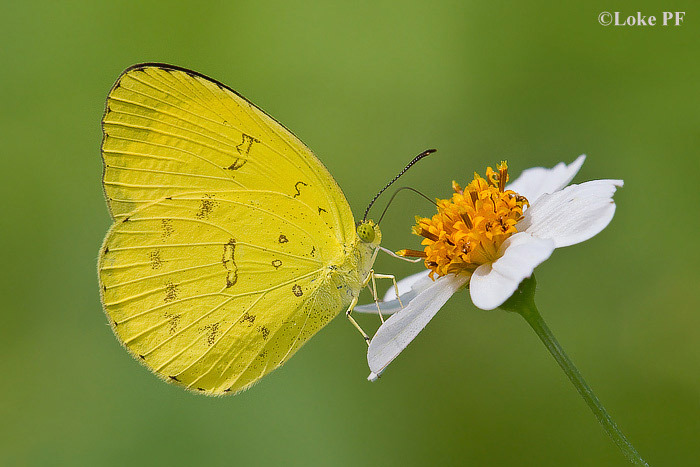 Above, the wings are deep lemon-yellow. The forewing has a black border which is regularly scalloped and deeply excavated between veins 2 and 4 (more so in the female than in the male). Underneath, the wings are yellow with freckled brown spots. There are typically three cell spots on the forewing and a black spot at the base of space 7 on the hindwing. It is not uncommon for some individuals to have a large brown apical spot/patch on the forewing. Males have a brand lying along the cubital vein on the forewing underside. 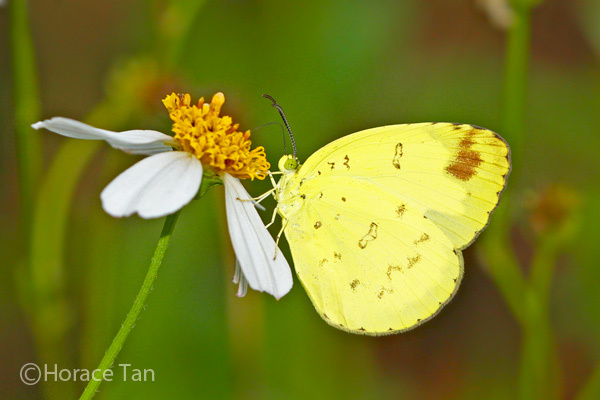 The Three Spot Grass Yellow is common in Singapore and can be found both inside and outside the nature reserves. 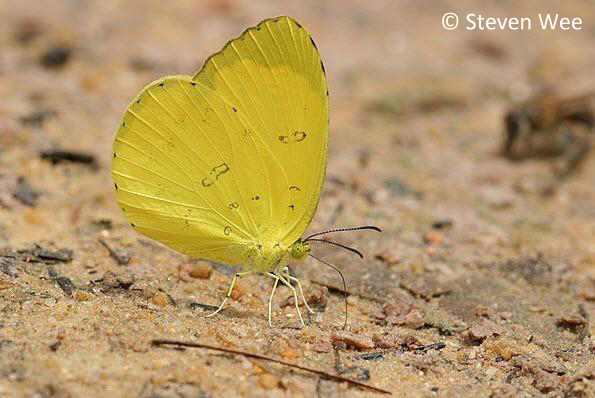 The adults can be seen fluttering in their habitatss in the company of other Grass Yellow spp. leading to difficulty in identifying them correctly. They regularly visit flowers for nectar and puddle on wet grounds for minerals. There have been records of population outbreaks when hundreds of them can be seen together in various locations across Singapore.